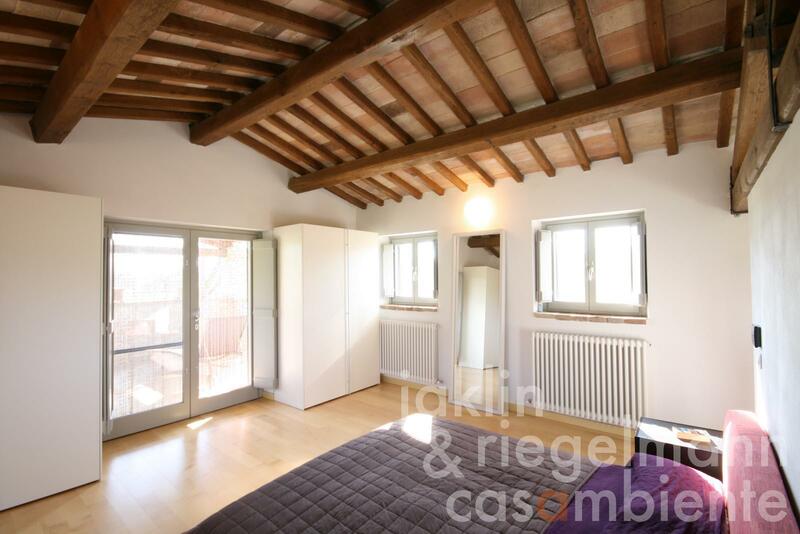 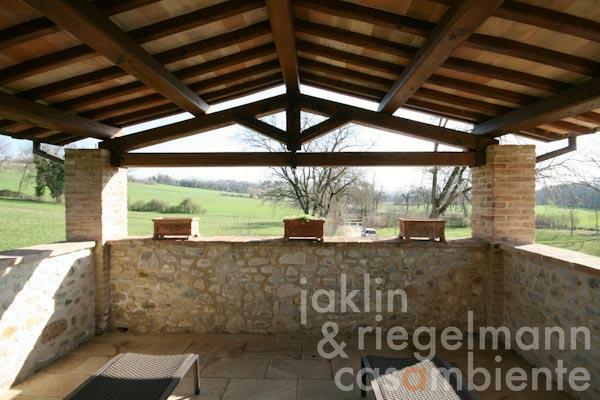 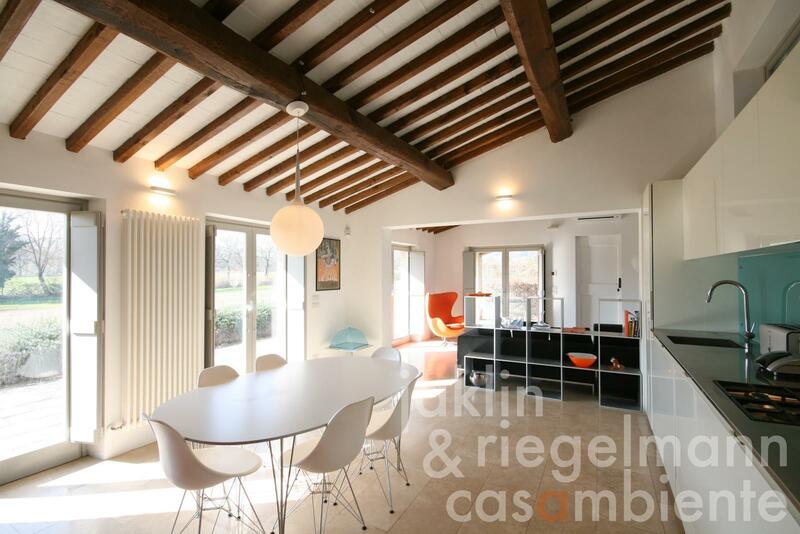 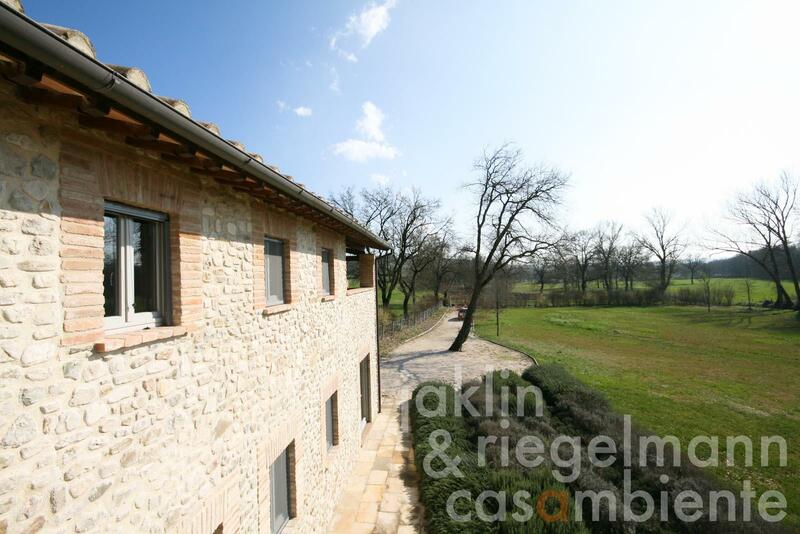 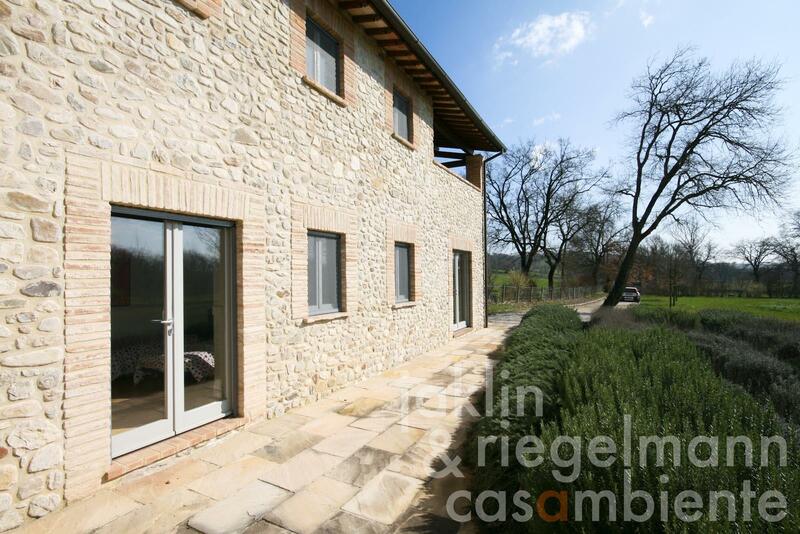 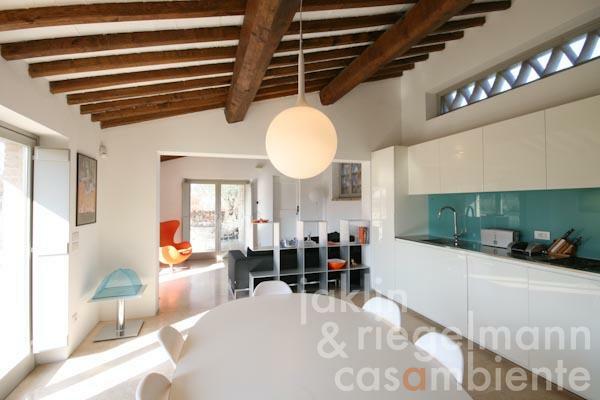 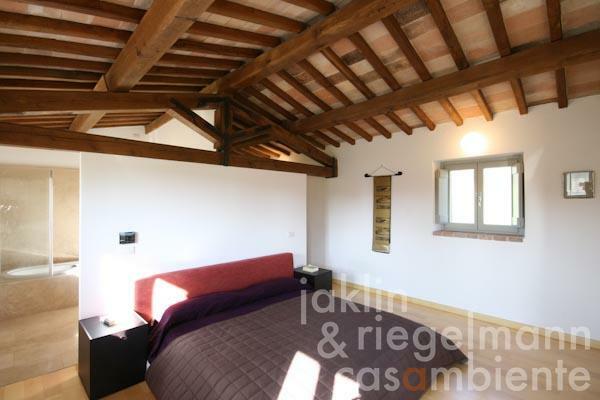 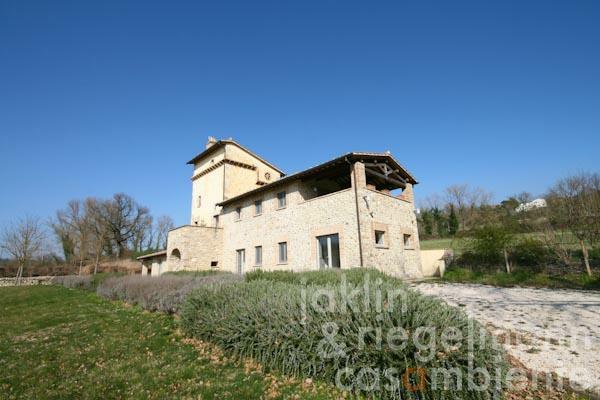 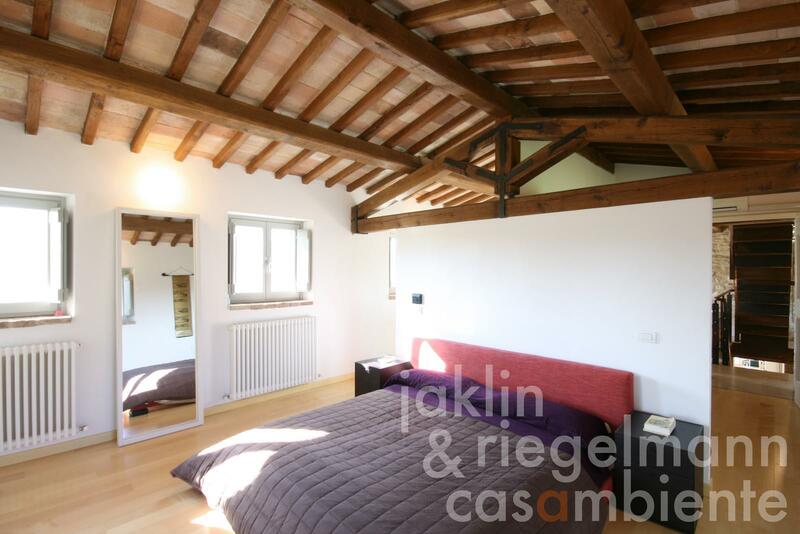 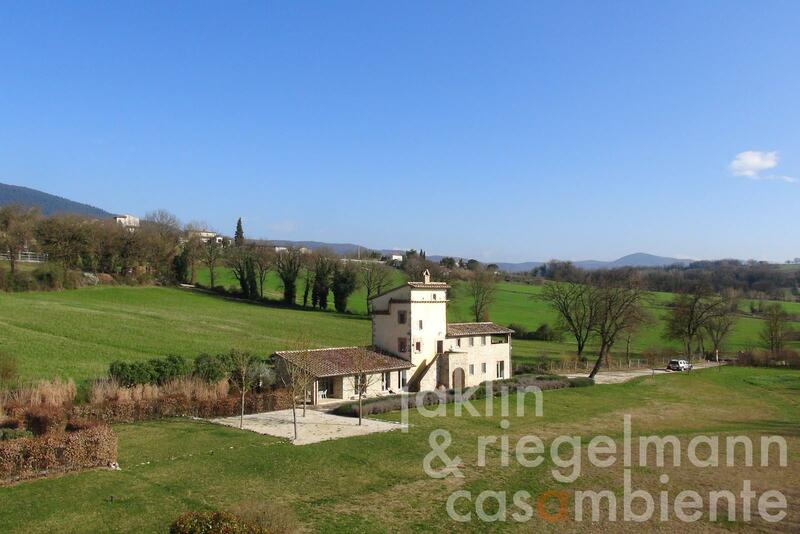 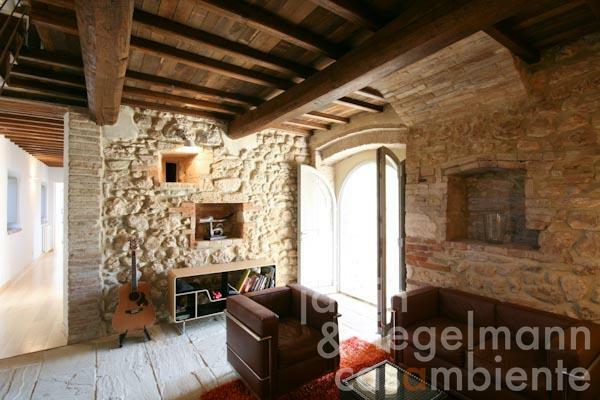 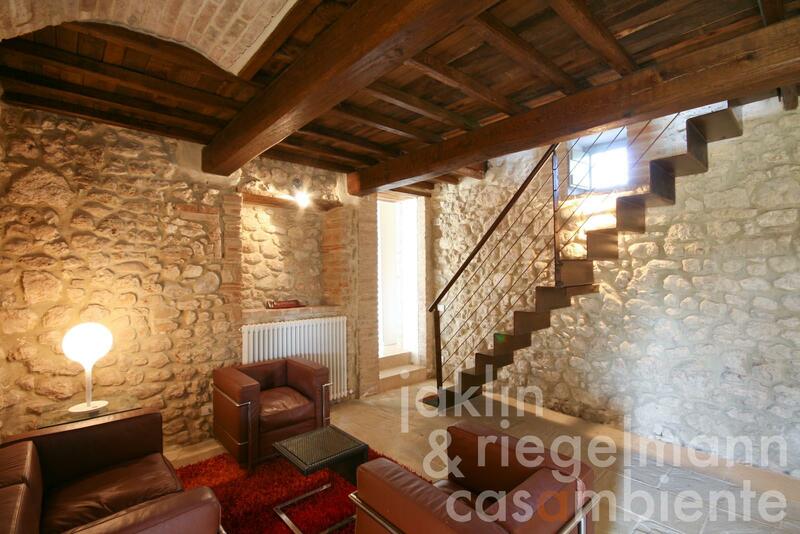 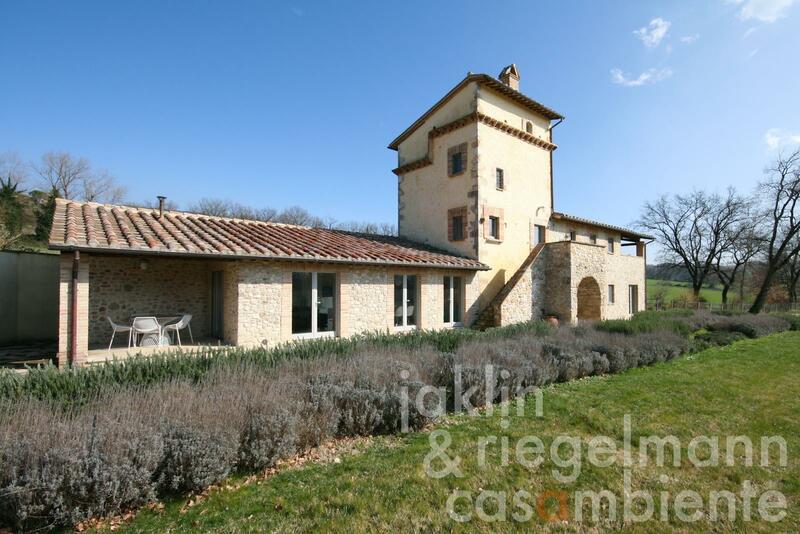 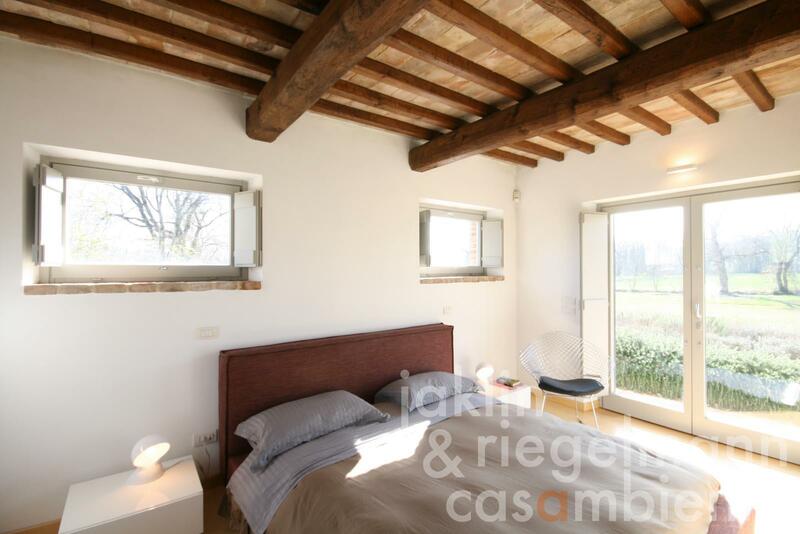 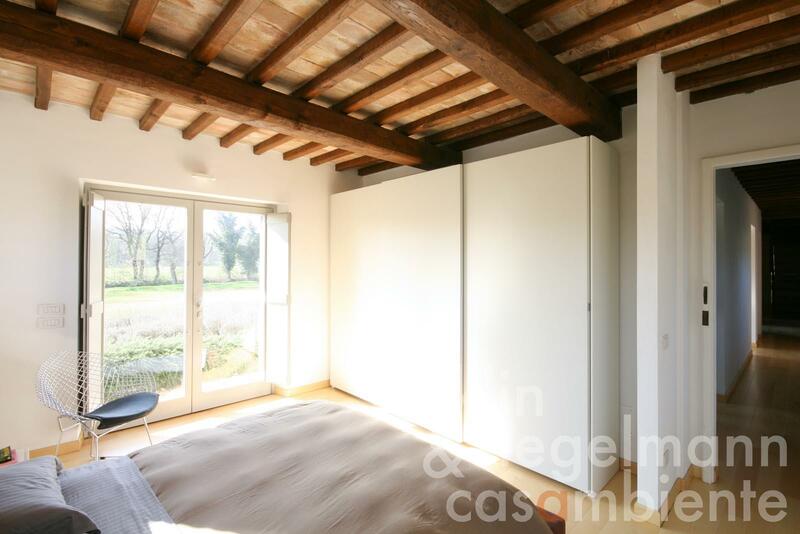 Historic tower restored in a contemporary style by Via Flaminia between the Umbrian towns Massa Martana and Todi. 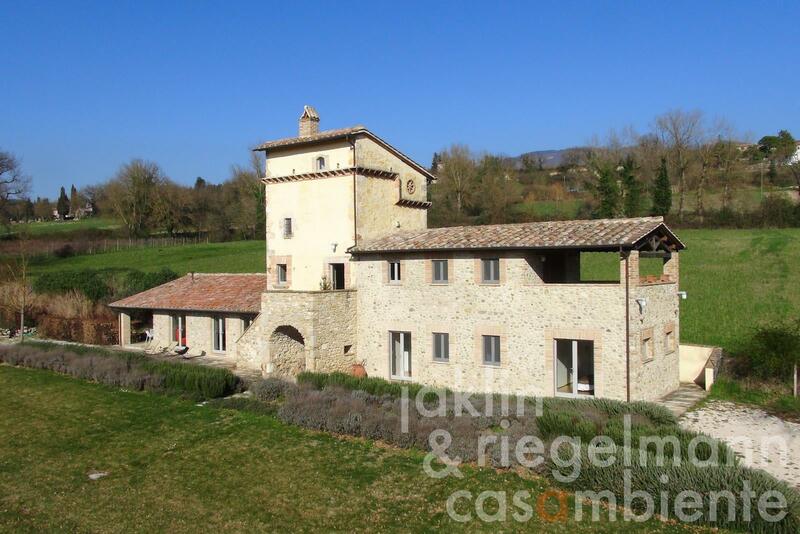 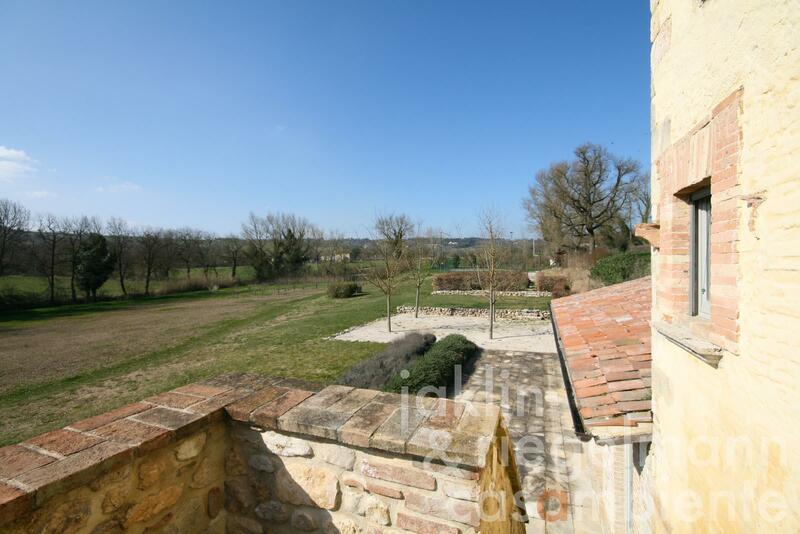 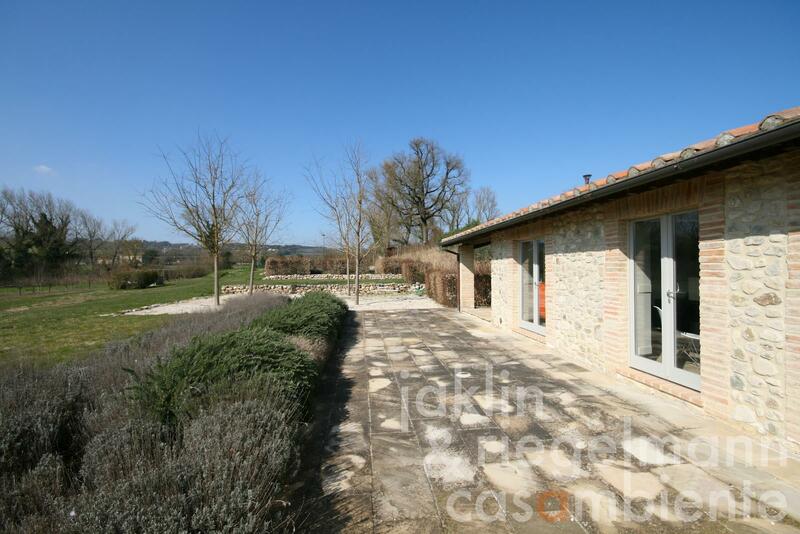 The tower for sale is located in a beautiful and wide valley with abundant sunshine throughout the day. 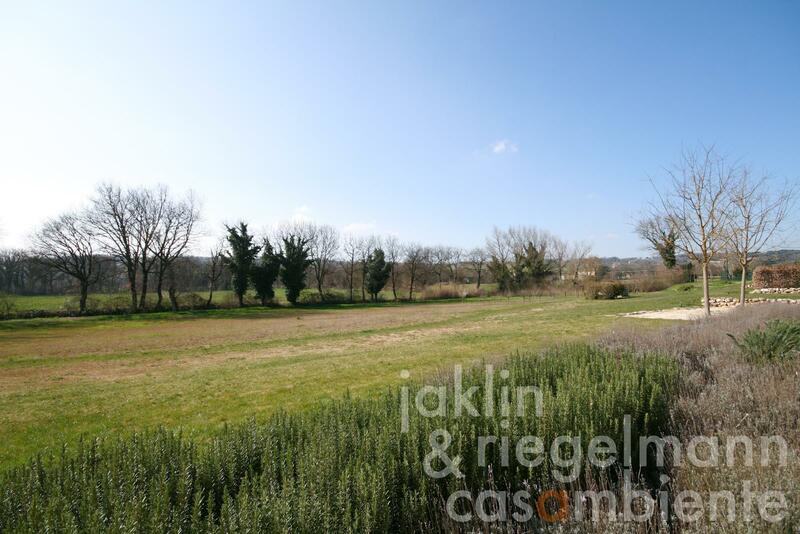 The surrounding plot is slightly sloping towards a small stream and is ideal as playing field. 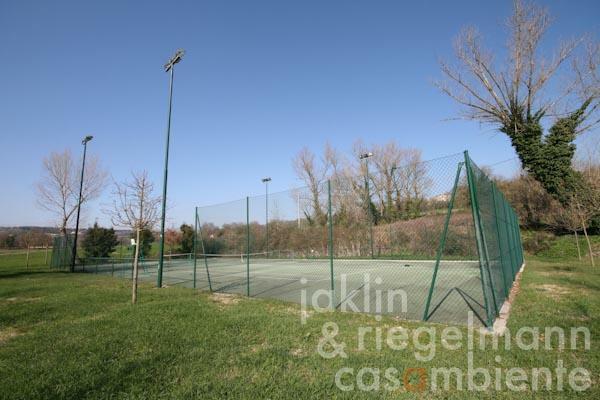 The swimming pool and tennis court with flood-lighting are located in a convenient and comfortable distance from the house. 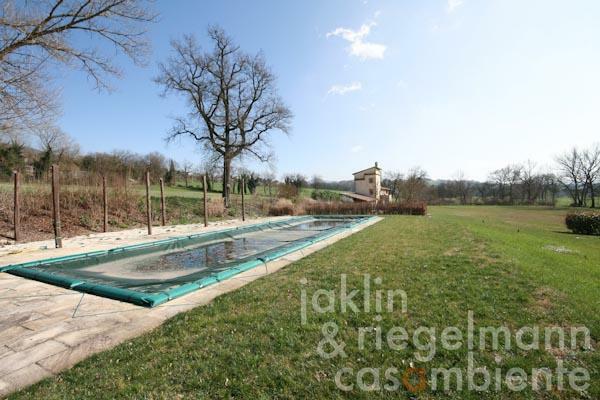 A small vineyard is located above the swimming pool. 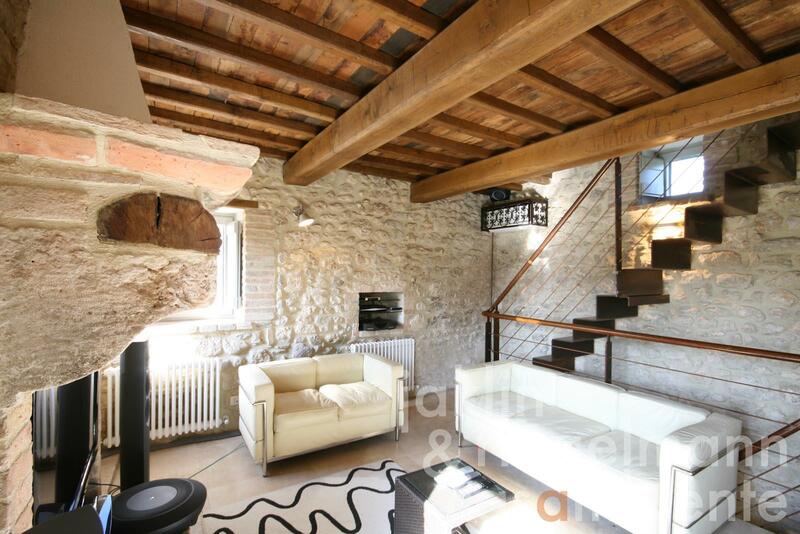 The historic tower was skilfully embedded in a modern and luminous living concept by a well-known architect. The spacious eat-in kitchen with underfloor heating is located in the single-storey wing on north and features four French doors with direct access to the terrace in front of the house as well as a covered terrace on the face side. 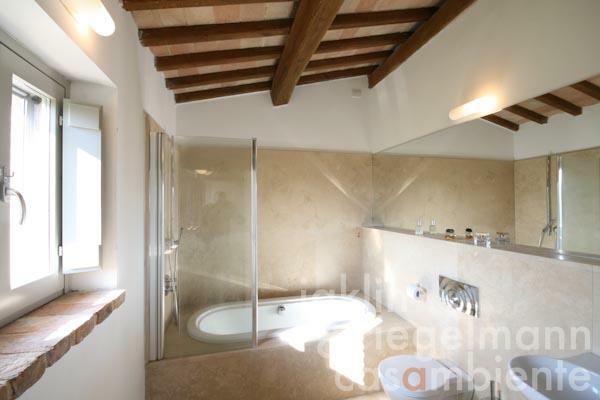 A laundry and guest WC are also located in this part of the house. The two-storey extension on south comprises two bedrooms and a bathroom on the ground floor, as well as a large master-bedroom with en-suite bathroom and covered terrace on the first floor. The historic tower constitutes the centre of the estate and offers an entrance area with lounge on the ground floor, a comfortable home cinema and living room on the first floor, which is also accessible via external stairs, and a fourth bedroom on the second floor with a well thought-out bathroom on a gallery above. 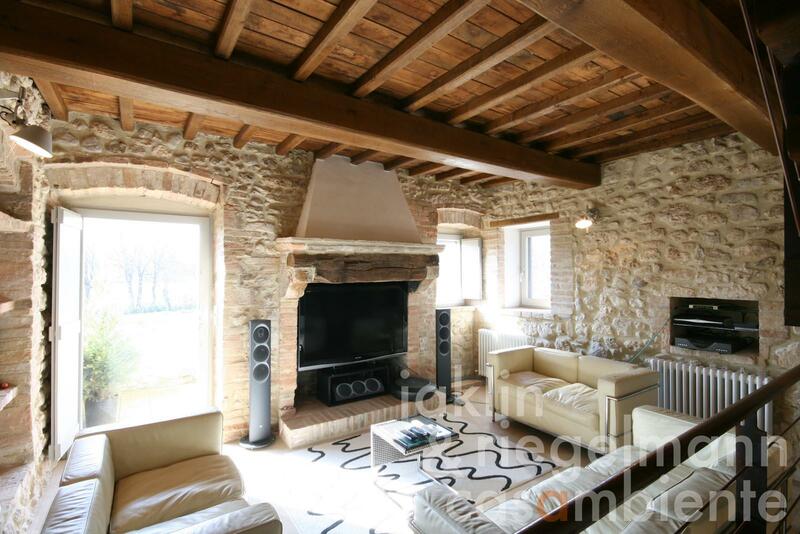 Italy, region Umbria, province Perugia, municipality Massa Martana. 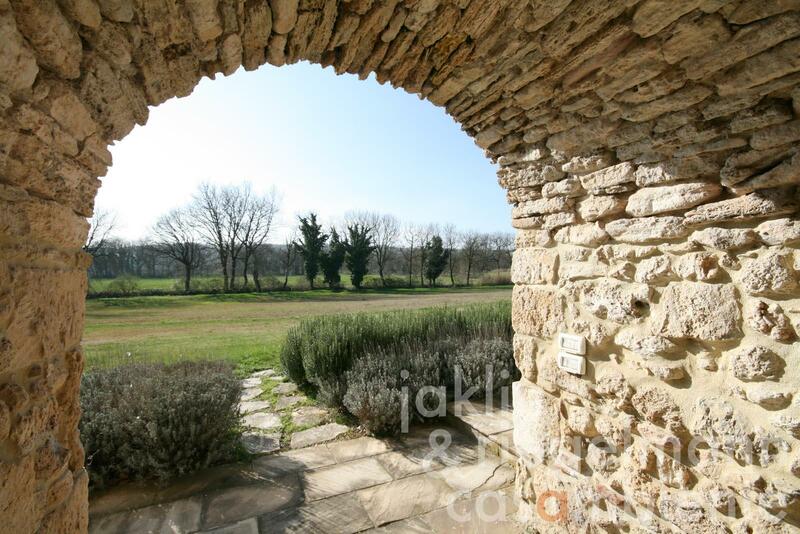 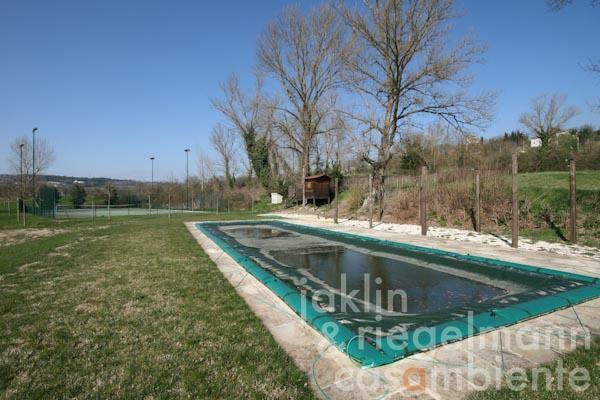 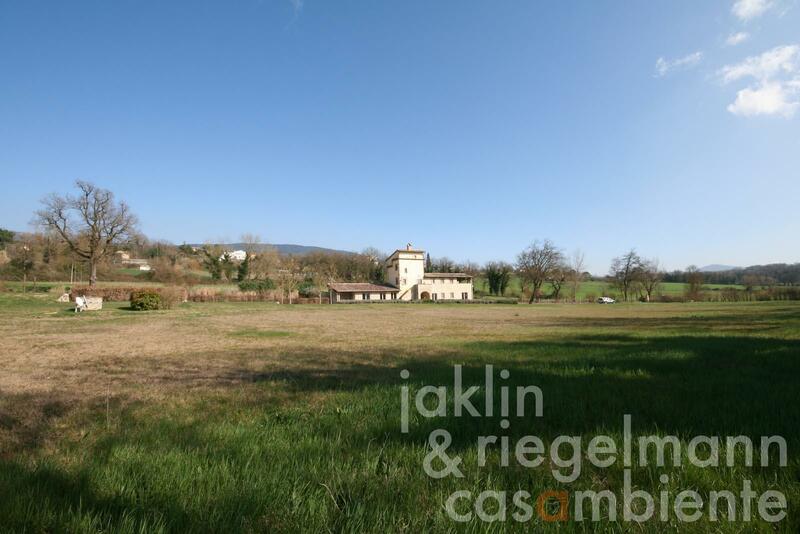 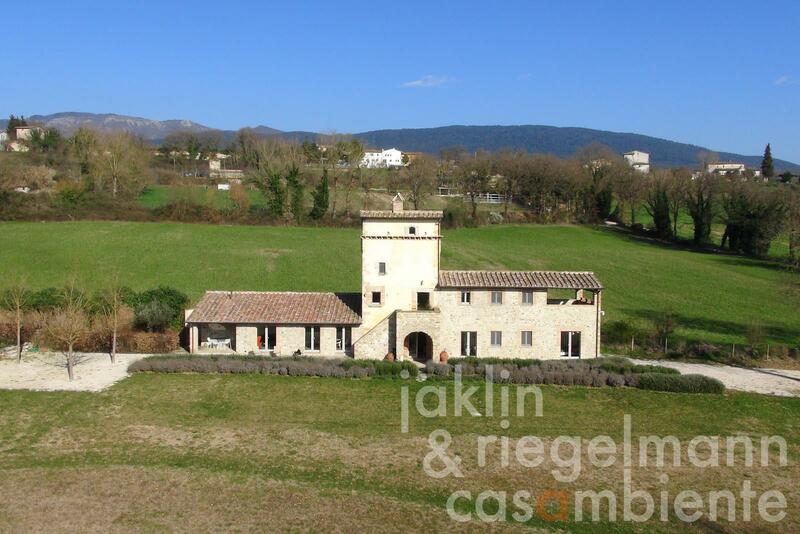 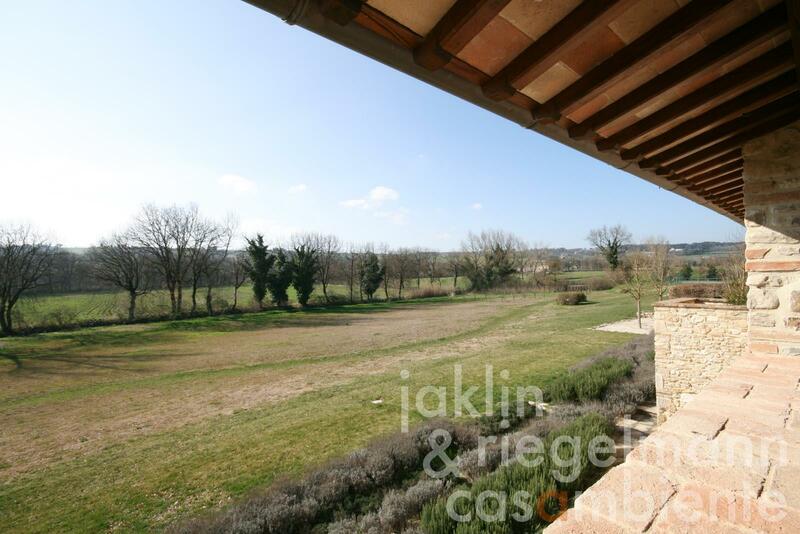 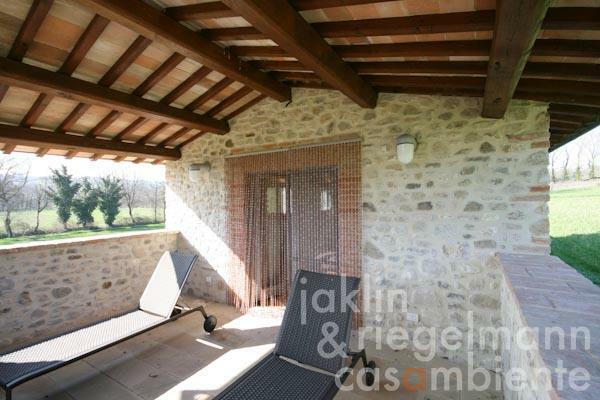 1.79 ha with generous lawns in front of the tower, about 1,700 m² vineyard, swimming pool and tennis court. 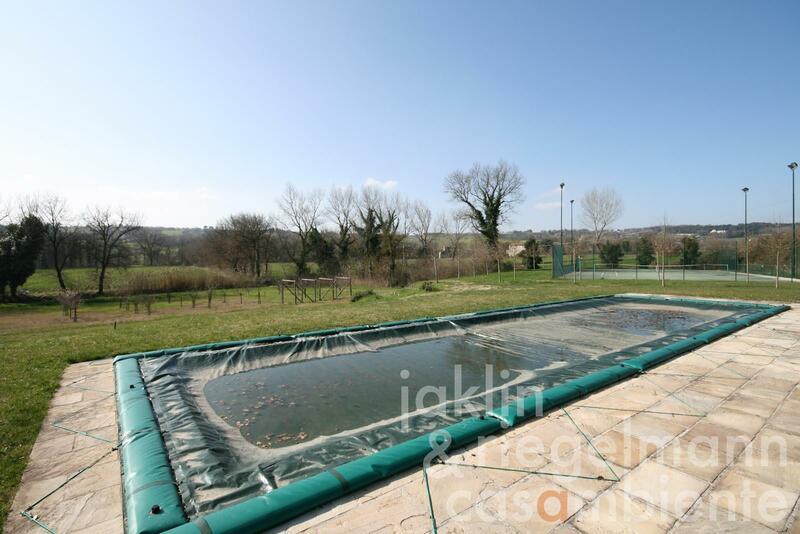 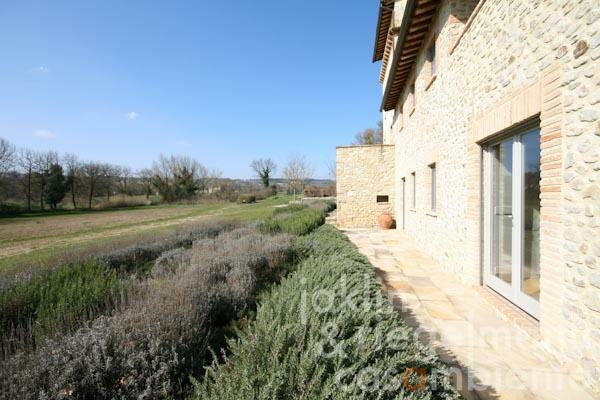 Electricity, mains water, own well water, central heating, underfloor heating, fireplace, air conditioning, gas tank, telephone, broadband internet access, satellite-TV, automatic gate, alarm system, irrigation system, swimming pool, private parking, terrace, vineyard, garden.